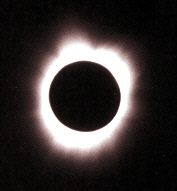 The first total solar eclipse of the 21st century occurred on June 21, 2001. 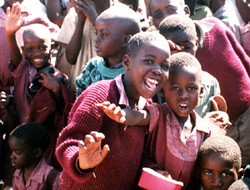 Crossing the south African subcontinent, the event could be viewed in Angola, Zambia, Zimbabwe and Mozambique. To observe the solar eclipse, a safari of visiting Americans journeyed to the village of Rushinga in the northeastern portion of Zimbabwe. In Rushinga, northeast of Mt. Darwin, the day provided comfortable temperatures and a blue, cloudless sky. The villagers, including the children of the local elementary school, felt the building excitement with the approach of totality. At this location, the early, partial phase of the eclipse became evident at approximately 1:30 PM. This image was photographed using a Canon EOS Elan II camera with a 300 mm lens and Baader AstroSolar, a solar filer. The film was Fujicolor 400. A solar eclipse must never, never be viewed with the naked eye as doing so can cause permanent eye damage. There are safe viewing techniques that should be employed. Totality at Rushinga lasted for three minutes eighteen seconds, with mid‐eclipse occurring at 13:16:05 UT. This totality image was safely captured without the use of a solar filter as the sun was completely blocked by the moon. The blue sky appears black due to the intensity of the available sunlight. At the airstrip in Rushinga where visiting Americans and the local people gathered to watch the eclipse, a loud cheer and spontaneous applause greeted the magnificent sight of a total solar eclipse, one of nature's greatest spectacles. Immediately following totality, the "diamond ring" effect was clearly visible as the first direct rays of the sun re‐emerged. This is a solar filtered image. These close‐up views of the eclipse do not adequately display the colors of sky nor the quality of the light of a solar eclipse. As totality approached, the light noticeably dimmed although not as if a cloud where overhead nor during twilight. The light assumed an almost iodine coloring. At the instant of totality, the sun seemed to rapidly shrink and disappear as if swallowed into the newly visible black hole in the sky. The sunlight around the darkened center was brilliantly white, with a blue sky all about. The colors of sunset, red and orange, blanketed the horizon in every directions. The planet Jupiter can be seen in this photograph below and to the left of the eclipse. This image was taken without any filter and is displayed in true color. 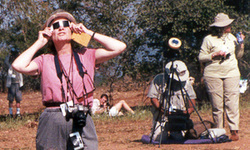 The total solar eclipse portion of the safari was hosted by Astronomy magazine, with officials from the magazine and the local amateur astronomy clubpresent. Some visiting American amateur astronomers monitored the eclipse with solar filter equipped eyeglasses, and others by solar telescope. And for all present in Rushinga, Zimbabwe on that memorable day, witnessing the total solar eclipse was a wondrous and unforgetable experience. Update: There is additional information on this topic on America's 2017 Solar Eclipse. Take a look!